TEDx Vaduz involved speakers with various professional backgrounds, working legislatively, empirically, theoretically, and artistically. The event's 12-minute time slots proved a real challenge as the format required extreme compression of months, and for many of the speakers years, of research. Many of the artists who spoke actively observed present trends to speculate on abstractions of the future. With artists presenting alongside other professionals, it became evident that radical claims within theoretical or academic research fields were no less imaginative and playful than those made by artists. A few of the highlights are summarized below. Femke Herregraven, an Amsterdam-based designer and researcher, presented various concepts that run through her areas of research such as geographies of avoidance and finance's ability to carve out new geographies through spatial organization. Her research is drawn from places of legislation and the ambiguity of language in administration, which leads her to the materiality of secrecy and silence of exchange in her design projects. Emily Segal, an artist and brand consultant based in New York, spoke about the luxury brand, its relationship to scarcity, and luxury's ability to also be mass luxury. Segal addressed discomfort and what makes us uncomfortable about consumption, which relates to luxury brand's reliance on scarcity in a place of mass crisis. She traced the fundamentally uncomfortable path of luxury itself, which leads to a search for specialness, which leads to a search for authenticity, which leads to the luxury of choosing utilitarian non-specialness, summarizing the formula of the MA-1 bomber jacket, a status symbol of not being special. Reminding criminals of the fact that they are criminals triggers more dishonest behavior. Reminding bankers of their professional identity triggers more dishonest behavior. In his recent TED talk about the problem with TED at its recent conference in San Diego, Benjamin Bratton criticized the placebo politics and misdirected faith in technological answers embodied by the KONY 2012-stained TED brand. Where TED is meant to anticipate solutions to global problems, it really never addresses underlying structural issues, focusing instead on neatly packaged ideas and gadgets ready for airdrop in to any crisis zone. Can we conclude that TED is a pointless outgrowth of venture capital blindness? Perhaps it isn't entirely devoid of possibility. While we critics fall into cynicism about futuristic solutions to current problems, there is a need for other ways to think about the future. The question, "so what now? ", is becoming inescapable. One crucial problem with the TED brand isn't a lack of ideas, but the sameness of its presenters' positions. While bringing people together from different expertise is valuable, it's only beneficial if these ideas also have room to be in opposition to each other and the broader world. 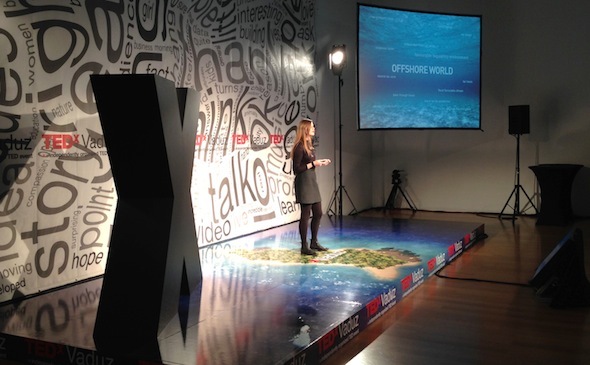 Mobilizing the TED brand in order to bring exposure to experimental but legitimate research and artistic practices, TEDxVaduz served as an alternative to the general expectations surrounding a TED talk. Each person's presentation was a performance in the sense that giving a presentation is always a performance, but there was no pushing of a recently published book or listing a long tail of founded companies. The variety of positions represented resulted in a considered curatorial project within the widely debunked and soon-to-be dated format of TED. Indeed, the TEDxVaduz strategy of occupying an outdated structure and opening it out to new possibilities might offer a key to the broader problem of how to refocus discourse about the future away from technological solutionism.